It's got some issues but it's a very cool old van. "...there is a little amount of rust on the rear doors and the drip rail but nothing looks perforated yet." I guess he's got a different definition of perforated than mine. It is a cool van though. Doors are perforated, roof rail looks like some fairly nasty scaly rust, but maybe not all the way through yet. 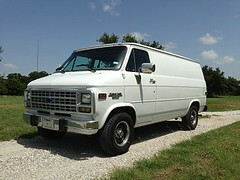 Cool van, worth half that asking price considering what it will take to fix the rust. It's a cool old rig. I like the CB on the ceiling, but I'm not a fan of the giant under-dash a/c unit mounted IN the dash.